But there is one thing that America has done, a thing of immense bravery and courage, that I willingly doff my hat too and salute. YOU HAVE PUT TWELVE HUMAN BEINGS ON THE SURFACE OF THE MOON.!! Lets think about that for the moment. 12 superhumanly brave men, bold New Knights, have actually walked on that sunlit ball of rock that arcs (or that we twist round in front of) over the back of my yard of a nighttime...yes yes, you started out in desperation to keep up with the Russians who were creaming you, but hey when you got the bit between your teeth...you really came through. I say this with the awe of a man who did the Gemini and Apollo Space race as his High School science Project, while it was actually happening, and sat through hours and hours of TV in the first years of the 70's totally in reverence at what he saw happening on the moon. I was watching the future unfold. Spin forward 40 years..and now the quickest way to get me into a barroom fight is to tell me it never happened, and for good luck throw in stupid facts like; the flag waved 'in the wind' on the moon, and they also showed how it was done in the film "Capricorn One " didn't they!!! Its been a hard battle, not helped that up until now NASA has been reluctant to write many books about one of the greatest things that ever happened, and release all the footage that was taken at the time. The conspiracy theorists have all but neutered the youth of today.... REM even sang that " if you believe, they put a man on the moon..., etc. , etc.."
But I kept the faith, and now dear Knights and Ladies we can at last all revel in the truth, and any disbelievers will get an email with these links in, so they too can marvel...hopefully in added shame. www.apolloarchive.com this is what I give you. Go to this site, then click on Apollo Multimedia, which is in the menu on the left hand side. This will quickly bring you to a full compliment of audio and video material from all the Flights of the Apollo Project. You will soon see that, in the late sixties they of course didn't have magi-cams the size of a dime tucked away everywhere. Heck, my mobile phone that hangs off my belt everyday has got more telemetry number crunching computer software in it than the mother ship even had. 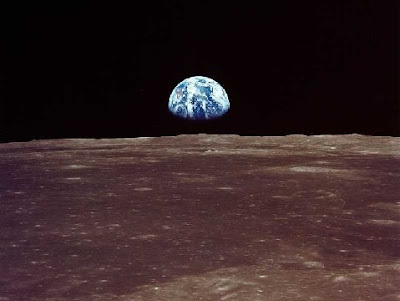 So from Apollo 8 to Apollo 10 it is all Audio, when a quarter of a million miles away. Then 11, and the first Giant steps in camera technology followed too. Till we get to Apollo 15 to 17, where the whole project had run out of ideas, and taking camera footage to prove it had all happened was considered to be one of the major tasks. So tune in, sit back and marvel at the sheer bravery and skill of twelve supreme men and six unbelievable pilots. ... and if nothing else, just watch these 4 short highlights in silent awe, then i will allow you to say, God bless America. 2) Apollo 17 : (Real Video) Return of Lunar Module Challenger from the Lunar surface as seen from the Command Module "America"
3) Apollo 17 : Immediately below 2, the reverse view from the Lunar Module. One last fact before you get back to work. As a potential astronaut, it was good to have the brain of Einstein, and a first class degree from Harvard, all on a body of Hercules, and with the bravery of a Congressional Medal of Honor winner thrown in. But if you couldn't stand 7 G's i.e. : your body feeling SEVEN times as heavy as normal, for FIVE WHOLE MINUTES!! Then you FAILED. I do believe 12 men walked on the moon. I too was enthralled with watching this modern day version of Magellen's voyage around the world on my flickering black and white TV. There are always opposites in life, those who choose to CONspire and those who choose to INspire. I never liked being a CON! America needs to find a reason to make a difference again. I'm also very proud of my sister in law who works for NASA. Excellent. And, let's not forget No. 13 -- sometimes missions don't go as planned and you have to create solutions to survive in a "problem" situation. Billions of dollars spent to put men on the moon? "Why, do you know how many people that would have fed?" I guess so, but the bigger picture is how many people were "fed" inspiration. "When you're putting people on the moon," writes scientist Randy Pausch, "you're inspiring all of us to achieve the maximum of human potential, which is how our greatest problems will eventually be solved." Dream! And, give your kids permission to dream -- and create awesome science fair projects. Scars: Part 3 "The Birth of SCARBUCK'S!"